just like heaven. | escaped. 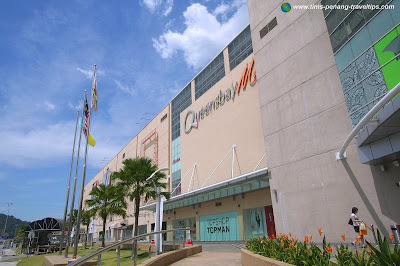 OK I just googled Queensbay Mall, Penang. And my goodness now I can't wait to go back home!! It's actually quite rare for this state to have a symbolic or known shopping mall like Mid Valley or KLCC; though the population in the island is higher than those in the land(seberang). And Chinese being like the main population here, it is strange all these years not having a mall as big as Mid Valley. And I am not exaggerating here. To top it all, it has Topshop, Forever 21, Zara, Dorothy Perkins, Somerset Bay, Guess, Liz Claiborne, MNG and many more..sigh..all only a few steps away from home. All these years, I've always have to spend a few days in KL before going back to Penang just to get things there that Penang doesn't have. 5 years in high school and 2 years in AAJ. Now I can rest and settle in Penang happily. It may not be Mid Valley or KLCC or OU, but who cares, with Topshop it's good enough for me. At least I have a reason to shop more at home. p/s : he's not too happy about this. Killjoy. oihh bashaa cis tau la dekat!! asal aku br tau je kewujudan queensbay ni. hahahaha.. tu la org seberang slalu lepak ocean ja.... slalu2 la dtg ke pulau.. bukan sje queensbay malah ade lagi gurney plaza yg sme tahap dgn mid valley..
gurney plaza smpi thp midval ke?asal aku rase cm kecik je. e leh e leh ek e leh..
mydin ade pe..tak men ar..
queensbay ni same ngan mid valley arr..
don't tell me u havent been there yet -_-"
i feel like a loserr haha.